Maps are compelling, aren’t they? And ancient maps doubly so. Gorgeously pictorial, they all – from every culture, scattered across the world – have striking similarities. For ages now I have been learning the geography of New Amsterdam by heart: The mill, the fort, the House of the Fiscal, the Market Place, the East India Brewery. The beginnings of New York are absorbing, and not just because of what they became.This was a new beginning, a cautious toe in a brave new world. And so: it was on an island, bordered on two sides by rivers. And where the settlement faced landwards, there was a city wall. 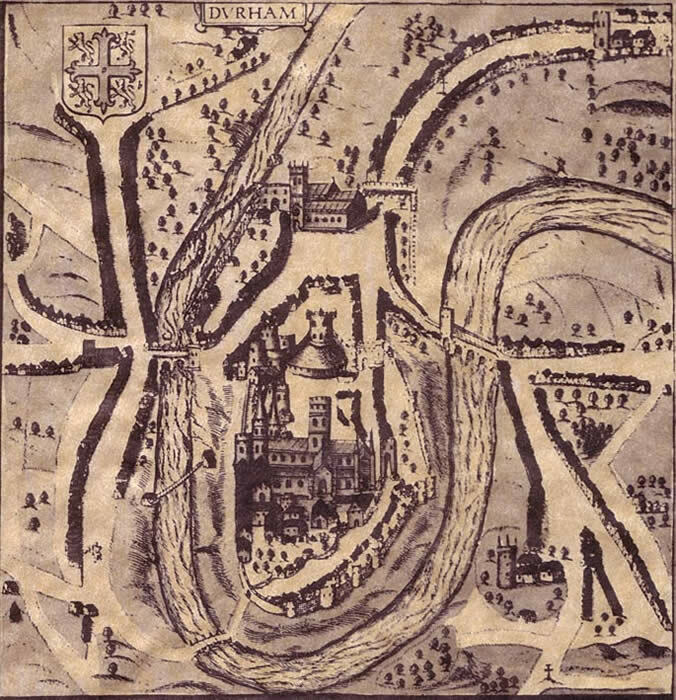 The wall is shown in 1670, though its survey was done in 1660. Cast your eyes across the globe to Tangier, less than a decade after the map of New Amsterdam. 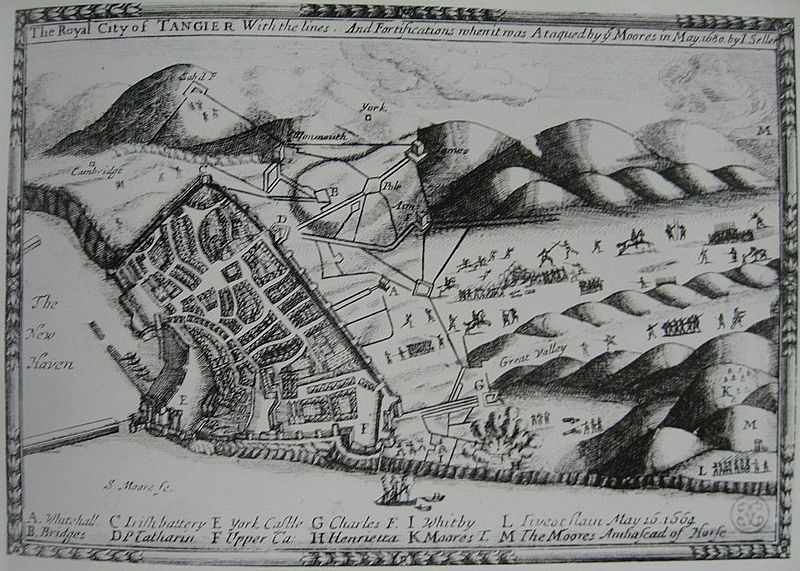 It was not conquest or exploration, but marriage which brought Tangier into the hands of the English. Charles II, for all his mistresses, managed to take a wife: Catherine of Braganza. Whilst many dowries might be a house, or a farm, Catherine’s were two cities: Tangier and Bombay. Look at Tangier. Bordered on two sides by water, and hunched with its back to the sea, the city is fortified by a spiky city wall. Within, houses are crammed in streets,and it has a castle, a church, fruit groves. Without, a mighty port on the sea and wide open space as far as the eye can see. Like a man clinging to the side of a cliff who gets a little purchase, these new settlements grabbed a defensive plot and clung to it for dear life until they felt a little more at home. Which, unfortunately, the English never did in Tangiers. The Moors soon ousted them. It’s all very Maslow. It was in 1943 that Abraham Maslow showed how, when we are in extreme need, we take care of our comforts in a particular order. Food, water and shelter comes as a first; and it is swiftly followed by the need to be part of a community, being protected from violence. The early colonial strongholds are this triangle in map form. They show with blatant clarity how man sets out to conquer the world. With extreme caution. As a country becomes one’s own, we can spread out a little. Get our feet under the table , so to speak. We know the end of this story: we can see any of these urban sprawls today. But I’m closing on a city that never was, a plan made by a man in 1717. 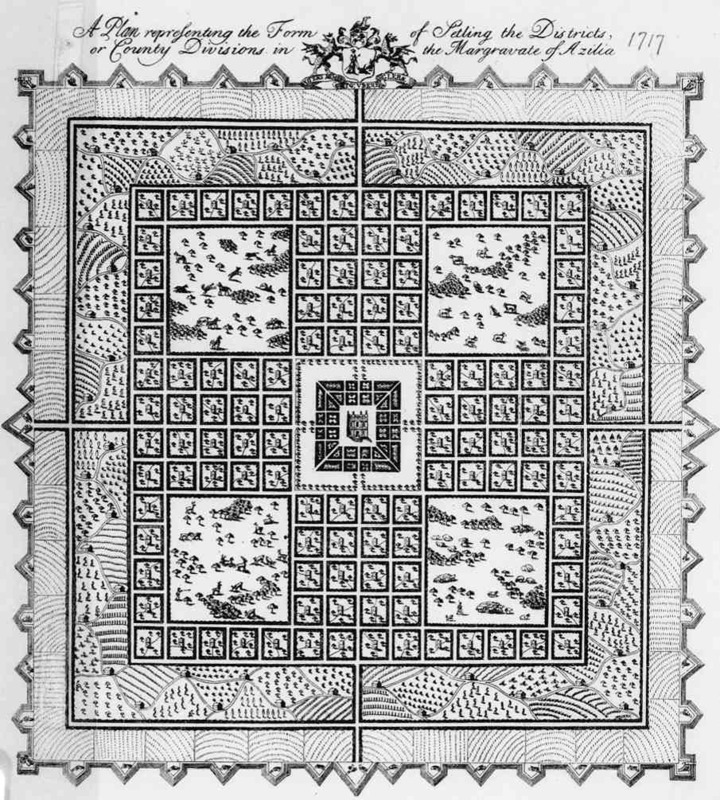 It was a plan for a colonial city. And it was to be called Azilia, and based right in the middle of the fruitful state of Georgia by a man called Sir Robert Montgomery. 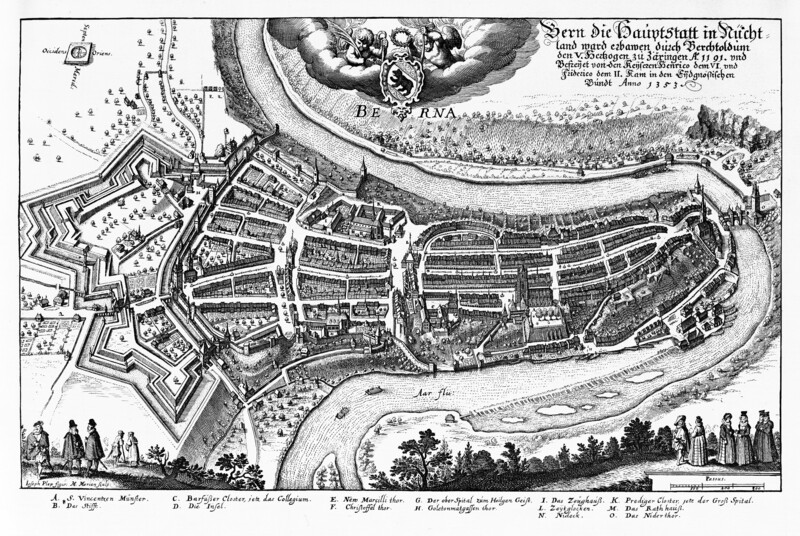 It was to be twenty miles square: not hedged by water, but by great thick city walls. No longer hunched against a patch of coast, but out and proud in the middle of paradise. Those squares? Each is an estate, one mile square. There are 116 of these in the plan. In the centre, a city three miles square surrounded by a ‘void’ of green land. This is a place built with security in mind, sure: but also self-fulfillment. A colonial paradise: a sign that we are home in far distant lands. It was never built. But to me it is a bridge between those hunched cities, with their backs to the sea and their muskets trained over the city wall, and today’s great urban conglomerations. Posted in Quirks of HistoryTagged cities, geography, history, maps, settlementBookmark the permalink. alas, if the founders of Jamestown(1607, Virginia) had been just 1/10 as smart…..
Not a happy venture, Carl. The sites of towns and cities have been tied to rivers and seas for eons. There is everything that is needed in the waters; food, transportation, security. Living on the coast of South Carolina, we feel a real affinity with the 5 rivers and the ocean that surrounds us, something about being able to walk on a shore and watch the waters move…back and forth…up and down… mesmerizing. Wonderful, Lou. Water is a lifeline, for sure. The benefit of proximity to the coast and rivers, of course, being the ability to transport needed goods betwixt outside the stone walls and in. Nevertheless, the plans for Azilia would be interesting to see full scale. Laid out rather like a formal English garden . . . designed to reign in chaos and impose order. Yes: water was a means of transport and in those early days a vital line of supply. Whie a settlement got on its feet it needed to be able to get everything it needed from further afield. You remind me, Nancy, of the Berlin Airlift, and latterly of the Falkland Islands, whose general hospital is still in England. When someone is seriously ill they are still airlifted back to Blighty. Fresh fruit is scarce are treasured there still, brought as it is from far away. Of course, all those walls were meant to keep out the very people whose lands these dreams of new homes were carved out of. Walls have three sides: as borders, to keep people out and to keep people in. Excellent point, Rafael. Colonies are by their nature predatory. I’ve spent most of my day in Tangier, today. Well, writing about it. I’m in the throes of writing, with my sister, a family history.Today the effort was centred on my Great Uncle Frenderick Irwin who was the King’s Dragoman to the British Legation in Tangier in 1895. We have this treasure trove of wonderful pictures, maps and documents of the time. Gracious, talk about coincidence, Roger! I envy you. The maps and papers surrounding such a city must be enticing indeed. That Azilia map is a work of art in itself. I’ve seen other “planned communities” mapped out and actually constructed, but none with the rigid pattern of Azilia. Yet if it had been built, who’s to say it wouldn’t have been just as functional as many other cities, with its formal layout not readily apparent from ground level. I might have worked , PT: what a shame we will never know. Can’t help noticing the synchronicity of Durham being one of the places singled out in your post – after that, I’ll be sorry if granddaughter doesn’t go there! This is such a fascinating piece, with so much to delight the eye and mind. From New Amsterdam to Maslow to Albizia. I wonder how the latter would have turned out? Maybe it would have benefitted by some input from Lancelot Brown. Thanks, Col. I have always loves maps, especially old ones. Who knows how it might have turned out? The lack of water is a puzzlement. Perhaps they had a lot of wells. 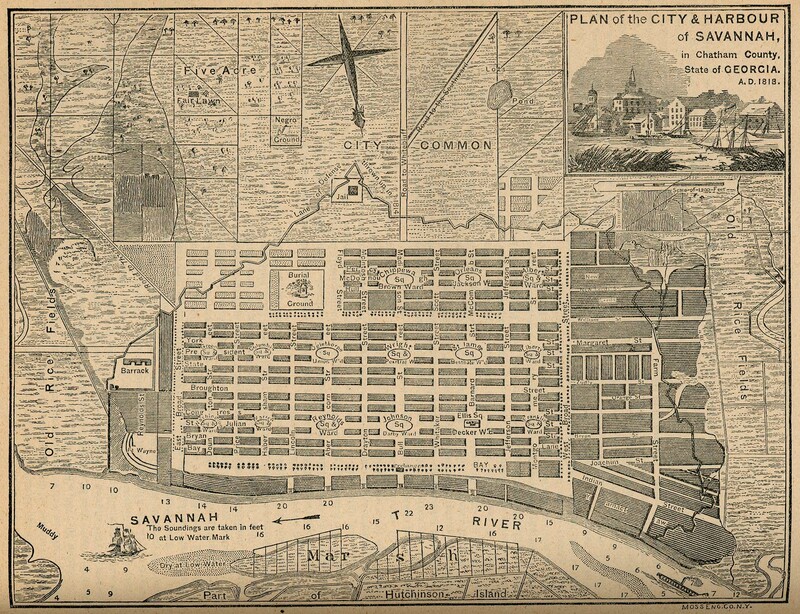 The city of Savannah, Georgia has an orderly layout, though quite like the one for Azilia. I love walking there. The squares are just perfect. Each one has its own character. I’ve been doing some research for a book, and the history of NYC has been part of it, though not as far back as this. I did get the chills when I walked across an intersection that was part of my research, though. Hard to imagine what it looked like during the period in question, but interesting to try. It is. I would love someone to invent a time machine where one could not interfere, just watch the laters peel away with the years. Catherine’s dowry included the cities of Tangier and Bombay? Imagine being given a city as a wedding present. I would think you must be right, Rosie, though what a basic thing to leave out! I am wondering if wells or springs were present on the site. If not, it certainly explains why it was never built. Great post Kate – very observant, especially the idea of the missing link. Good to see Maslow getting an outing as well 🙂 Those pictorial maps are wonderful – Croatia is a city like those – hedged by the sea on 3 sides and defended by huge walls. I must set up a pinterest page of them all, Gabrielle: each one absorbing in its own right. Another thought-provoking post, Kate. As you know, I work in Tribeca, an area in lower Manhattan that’s inside that wall in the New Amsterdam map. The street where my building is located is still cobblestone. Your post prompted me to do a little research on my company’s building. I was surprised to see that it’s estimated that it was built in 1915. I always thought that it was much older — at least 19th century and possibly the 18th. It seems that there are few 18th century buildings still standing in Manhattan. My company’s building sits on very valuable real estate. I anticipate that when our 20 year lease runs out in the next few years, it won’t be renewed. The property will be turned into loft spaces for the 1%; the privileged city dwellers that live within their own walls. What a long way we have come, Lame. That answers a question of mine: on return to NY, whenever that may be, I wanted to see where Tom Payne might have stayed. Sounds like that’s no longer a possibility. What a shame to lose the history of such an absorbing city! Can’t help but think of my readings today for philosophy class – Marx. Between readings of Marx and Rousseau, I am of the mind that all city creations are steeped in evil, the more controlled the design the more controlled the people…oy! Ah, I think just the same way, Angela. It puts Christopher Wren in a much more sinister light! This post really speaks to me, Kate. 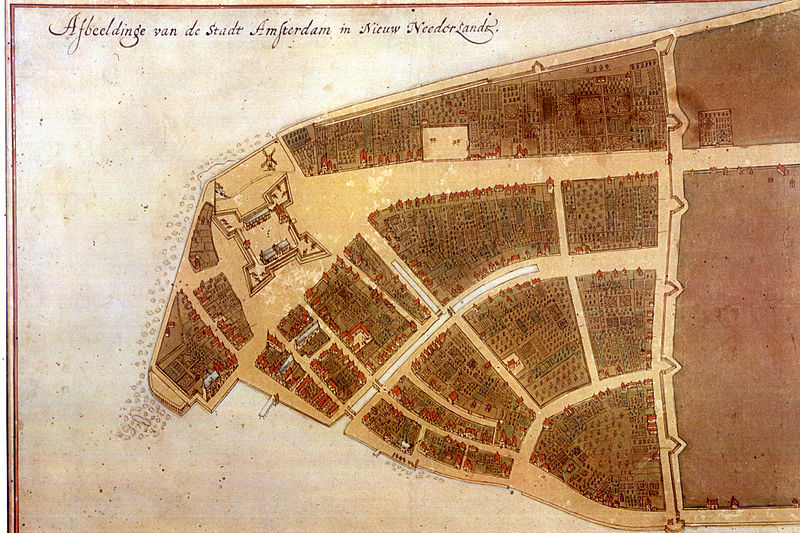 As you can imagine, I too know the streets of New Amsterdam… the fort, the wall, the public houses, etc. The Dutch carved out a little patch for themselves and held on for dear life. It’s funny how most new settlements start out this way, whether it was in 17th century New Amsterdam or Roman Londinium. I remember when I first heard about Azilia and I thought, but how could you have such a settlement without direct access to waterways? I guess the answer is, you can’t. Indeed, Weebles, Though I believe Johannesburg was founded on one tiny source of water, it doesn’t happen often and gold was a huge pull there. I hadn’t thought of Londinium, but you are right : I always think of it being a city straddling the river, but of course it didn’t start out that way. Those thick Roman walls are testament to it. I note Andra’s comment, and that’s what I first thought of with this Georgian dream city. The map did remind me of Savannah, too, so one wonders about the influences that came into play. I love to imagine the spirit of adventure mixed with courage that inspired people to settle in new lands, wherever their dreams took them. I never grow tired of hearing stories or imagining the events. I’d love to have an old map of the American west! i loved this post, Kate. Oh I just LOVE old maps and the stories they tell. Love it. I’d love huge versions on my walls, Ellie…. Yes: the day of the defensive wall is largely gone, in the Western world, Barbara. As you say: thank goodness. Maps are compelling, Kate. And these are wonderful works of art. 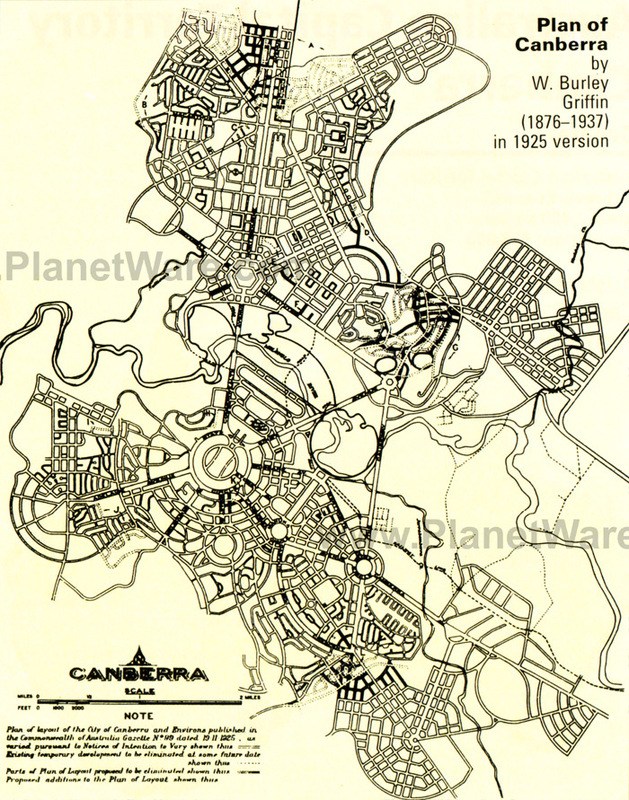 The plan for Azilia reminds me of another city originally built entirely to plan – Canberra. But all designed around circles! How lovely! are there really cities built without yielding to the shape of the land and water? Actually it has one of those anomolies, two surveyors one starting in the north and the other in the south,. one using Imperial feet and the other Cape feet (a smallish difference that added up to quite a lot when the roads were built.) A whole area has roads with an ‘unexpected kink’ all at the same place, not because of any natural feature, but because of the difference in Imperial and Cape feet.